It has been 79 long days since my last correspondence update. - The U.S. is tied with England, 14-14, and leads Australia/New Zealand 1.5-0.5. - CZE-USA has finished but there are still 2 games going in GER-USA. PGN of all 110 AUS/NZL vs. USA games. 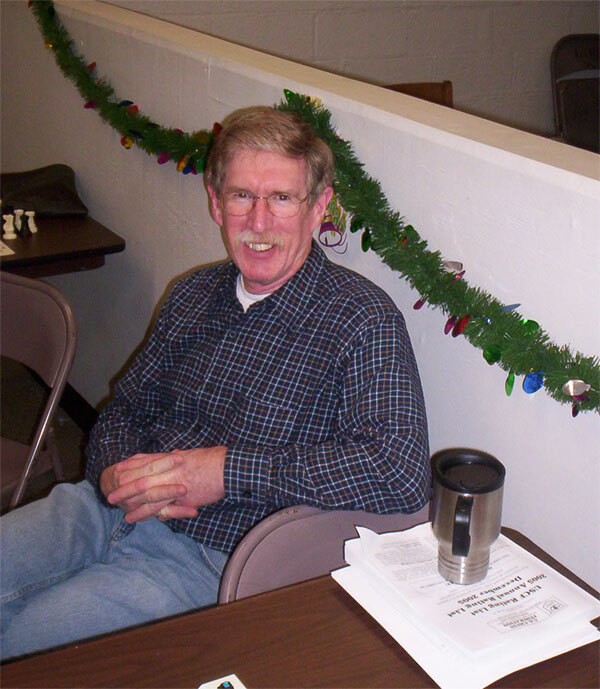 Finally, one of my opponents in section 3 of the U.S. Championship Semi-Finals, Harry Ingersol, was featured in the October issue of Chess Life (pages 32-33). 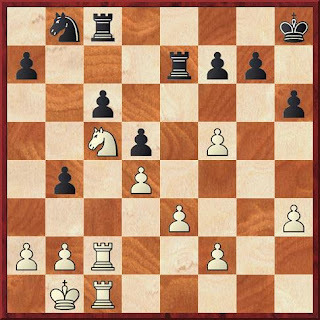 The Kenilworth Consultation game ended in a draw, as White didn't try to invade on the Q-side or attempt c4-c5. The 2012 Kenilworth Consultation Game was adjourned on Thursday night following White's sealed move on turn 31. Play will resume next Thursday (11/15) at 8:20 p.m.
LM Mark Kernighan (2233), Michael Goeller (2094), Dr. Ian Mangion (2042) are among those taking part. I am acting as White's moderator. For full rosters and notes, go to the event's Java-Replay page or download its PGN. The Westfield CC's web site is showing incorrect time controls for its November & December Quads. 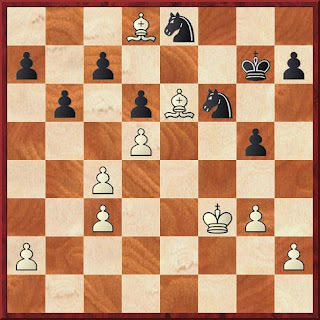 The time control for those events is G/40 TD 5s, as noted here and in Chess Life. The Westfield Y is still without power. So, there will be no Grand Prix or meeting there. Remember Daylight Savings Time ends at 2:00 a.m. Chess Mates has canceled tonight's blitz tourney and tomorrow's Quads. They are still out of electricity following Hurricane Sandy. Please check their blog and Facebook page for possible updates. The Westfield Fall Grand Prix, scheduled for Sunday, November 4th has been canceled because the Westfield YMCA, is without power. LM Mark Kernighan won the 5th Sy Fish Memorial with a perfect 5.0 score and distanced the competition by a point and a half. Dan Komunicky finished 2nd. Geoff McAuliffe and Joe Renna were joint 3rd-place and U2050 winners. Lou Sturniolo was the top U1750 and James Castellano was best U1525. Last round results, final standings and several games will follow. Renna: 1/2 point bye (requested). Mazzillo gets a 1 point bye. The event ends next Thursday night. To improve our chances, we (both teams) need reserves that can play on board 1 or 2. If you can help-out in that area or by being the Karpovs' captain/manager, please respond. Btw, each team is scheduled to play 6 of its 8 games at home! Bob Sherry collected 2 more wins and now has a commanding 3.5 point lead. Greg Tomkovich and Antonio Altamirano also won twice. With few scoresheets being handed in, there's no reason to upload a replay page and zip every week. Games will instead be added to the running PGN for 2012. The England-USA correspondence match is underway and we are currently in free time. Days used before August 1st will not be counted. 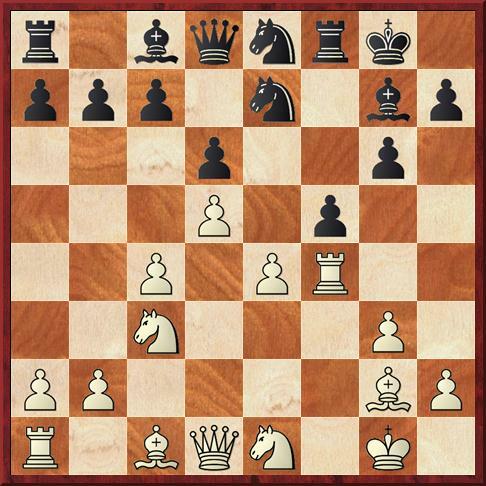 I am playing on board 7 against 2357-rated Jo A. Wharrier, who has 42 other games in progress. Starting Wednesday, August 1st, the Hamilton Chess Club will meet in the McManimon Building at 320 Scully Avenue in Hamilton, NJ. Quads will be run at the new location on October 13th, November 24th and December 29th. Bob Sherry regained sole possession of 1st place by scoring 1.5/2. Braeden Reinoso ran his winning streak to 13 games (!!) and I was routed by Pat Mazzillo. I have finally gotten around to uploading zip files and replay pages for events of the past 4 months. 7 games, 5 with light notes. 11 games from the Weeknight & Saturday tournaments in Rahway. Most were gathered from Michael O'Connor's Facebook page. Contains notes to my 4 games plus 4 scores culled from Jim West On Chess. 7 games of mine plus 2 others. 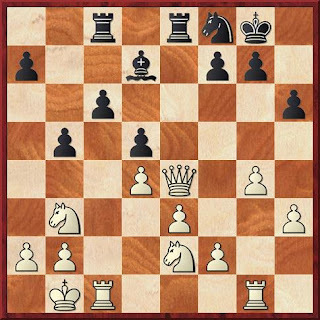 The Hamilton Chess Club has canceled the Quads it had scheduled for July 21, August 18 and September 22. Hamilton Township officials have told the club they can no longer meet at the Ray Dwier building. 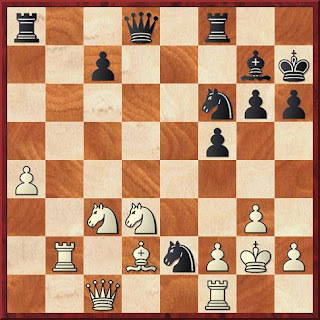 White launches an attack with 12.g4?! 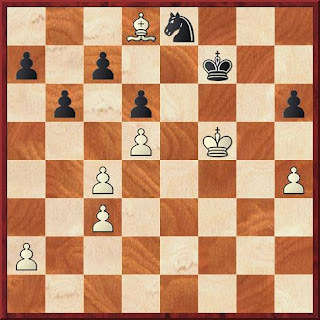 but Black, despite a mistake at move 16, refutes it and wins easily. 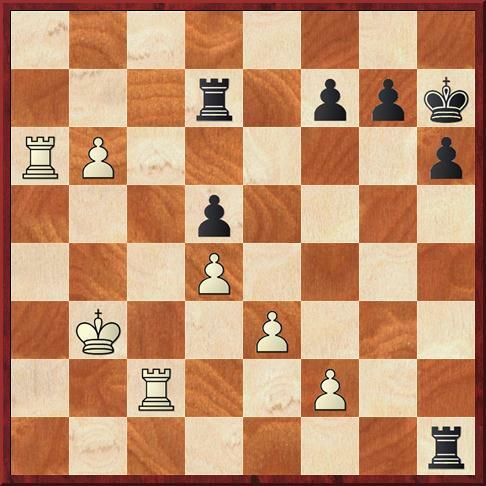 White misses the winning 19.fxe5 and settles for a draw. Both sides played badly after move 10. I hope to post annotated PGN files and Java-replays, for the Summer Tourney and other recent events, next week. I beat Ted Mann, took a draw against Praveen Balakrishnan and grabbed a share of 1st, alongside Bob Sherry. Braeden Reinoso, who has swept quads in Westfield the past 2 Sundays, ran his winning streak to 9 games with a pair of victories and is now =3rd, tied with LM Mark Kernighan. Jun Tang and Albert Tang joined just before registration closed. Prizes are now $77 for 1st, $35 for 2nd, $14 for 3rd and $14 for top U1200. Gerald Thomas won with Black on board 44, in a Steinitz French, to put the U.S. ahead of Sweden. The score is now 3.5-2.5. In other news: ARG-USA has finished. We won 37-15. There is still 1 game left in CZE-USA and 6 in GER-USA. A match with England in in the works. Bob Sherry maintained his one point lead with victories against Greg Tomkovich and Ted Mann. I won twice, to stay within striking distance, but should have lost to Chris Constantino. Mark Kernighan also had 2 wins and is now in 3rd place.